We offer single rooms with high standard furnishing. Materials of the highest quality of renowned companies were used to finish off the rooms. 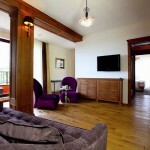 Each room offers the view of the mountain panorama. We offer 30 double rooms with high standard furnishing. Materials of the highest quality of renowned companies were used to finish off the rooms. 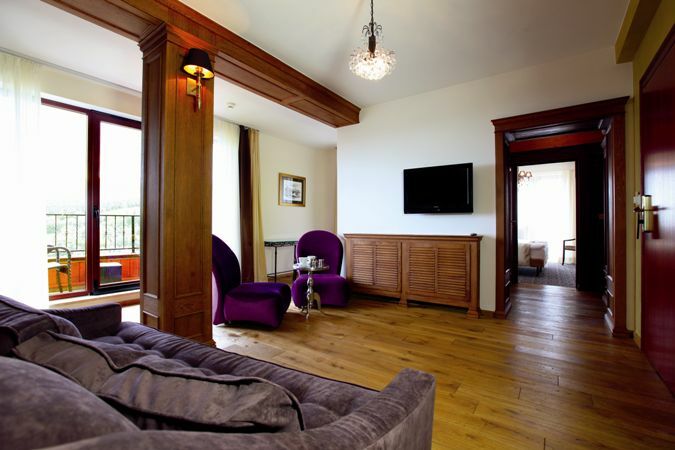 Each room offers the view of the mountain panorama. Breakfast is included in room price. Additionally we offer the possibility to book 4 rooms with terraces (this option is available while booking Executive Twin with terrace). We offer 4 double rooms of the increased area with a double bed. Materials of the highest quality of renowned companies were used to finish off the rooms. 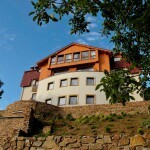 Each room has a balcony with the view of the Biały Kamień Mountain. Rooms especially recommended for stay with babies. We offer 4 suite type of rooms: bedroom, living-room, bathroom with shower. Luxuriously furnished rooms according to the newest trends of interior design world. 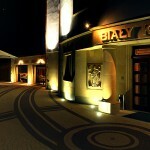 We give our Guests the option to choose a room with a fireplace or with a balcony. 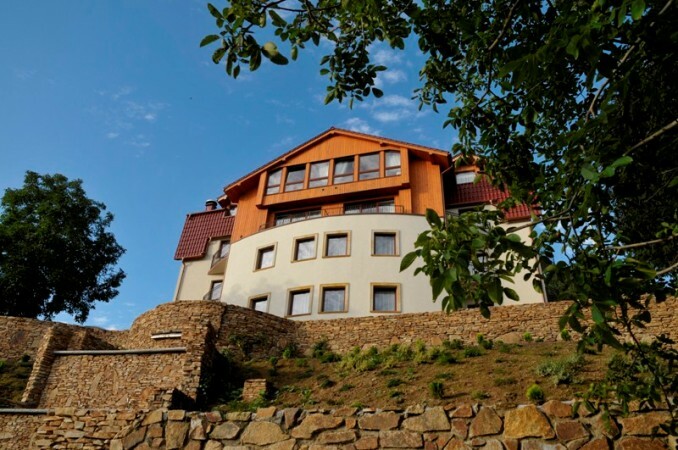 Rooms situated on the highest floors of the hotel guarantee breathtaking views of the Biały Kamień Mountain and Świeradów Zdrój panorama. Especially recommended for families with children because of the possibility of folding a sofa in a living-room. Let me interest you in the best venue for training, team building events and incentive stays. The proposed site is a HOTEL & Medi SPA Biały Kamień is a picturesquely situated health resort in the heart of the Izery Mountains. – location on the ski slopes in winter snow provides many opportunities min integration activities, horse or snowmobile dog-sled, and in spring, summer and autumn, a nearby hillside, and the near environs offer almost unlimited possibilities for classes outdoor min. former German tour underground tunnels, zoorbing, flying a glider or airplane. -We promise to treat each individual score in order to achieve satisfaction. -We promise a professional, punctual and friendly atmosphere, carried out the arrangements and preparations for the event. -We promise a dedicated long-term care one of your tutor group, cares about the details related to the visit of your group. -We promise to clear, accurate documents settling the event of detail expected by the Partner. – We promise you maximum relief from the duties involved in organizing and conducting the event. – We promise your satisfaction the maximum load of participants and heads of well-conducted event. 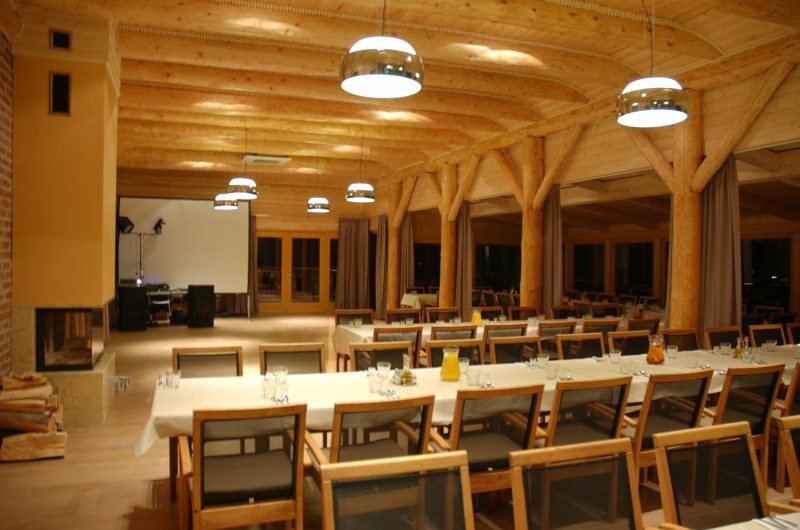 Welcome to the organization of training courses and conferences and team building events. Floating Our conference room provides comfortable space for 100 people can be freely arranged according to your wishes. For the purpose of integration events and banquets, we offer individually composed menu, the share of local bands, outdoor events and most importantly … delicious cocktails. In order to ensure privacy and an intimate atmosphere during the company’s stay, we offer a specially composed Company package includes a comprehensive rent the entire facility for very competitive terms. Modern, Lower Silesian biological renewal and rehabilitation centre of the Biały Kamień Hotel (Medi-SPA) gives the opportunity of regaining natural vital powers and offers the care of body and soul. Under professional care of the team of specialists and doctors we help our Guests to recover and restore the joy of life according to the idea of „coming back to nature”. Thanks to the unique location of our hotel in the mountain health resort we use in all our treatments mineral radon waters having beneficial healing effect that the Sudeten Mountains and Giant Mountains are famous for. Each day, weekend spent in Świeradów-Zdrój strengthens the organism and an interesting detail is the fact of the significant boost of libido of both women and men which can be read in German historic source documents. We have prepared for our Guests with the cooperation with well-known cosmetology creators innovative treatment procedures offering the highest quality. We have invited to this collaboration renowned companies which concentrate only on SPA & Wellness products and together with offered treatment packages it gives the adequate effects you wanted. anti-cellulite treatments, firming treatments, detoxifying treatments. The ski run has 2500 metres of length and diversified level of difficulty. It is snowed (21 snow cannons) and lit with the use of 68 electric-light masts with 136 lamps for skiing after dark. It is one of the three longest and well lit ski runs in Poland. The run offers skiing possibilites for skiers with various abilities, from beginners to advanced ones. Snowboard fans will also be satisfied. Parameters of the upper sector of the route (900 m) classify it to get the FIS homolagation (International Ski Federation) to run the competition in alpine skiing which gives the opportunity to run the competition of the championship of Poland. The upper sector is also a wonderful starting spot for paragliding. ****Reservation must be guaranteed with a valid credit card. Reservations must be canceled free of charge to 16 the day before arrival. **** 20 % DISCOUNT SPA VOUCHER for one person. 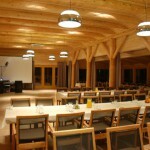 **** 20 % DISCOUNT VOUCHER FOR CONFERENCES AND BANQUETS. Voucher for 20% discount on rental of rooms for conferences and banquets (not applicable to catering). Cuisine: The aroma of morning at our Cafe& Bar is always associated with the aroma of freshly ground coffee and thick foam of Italian cappuccino. Tea-time... Always in good company of freshly picked raspberries and puffy mascarpone. The twilight welcomes the flavour of mint of Cuban mojito, the rustle of gold champagnes with the accompany of bloodred wines of the Rjoha region. This atmosphere is completed with the performance of dancing flames closed in ArteO. Cuisine: All dishes are prepared from selected products coming from organic breeding and farming, according to the idea of „coming back to nature”. We gather flavours and tastes from every season to gift it to you because Guests are our biggest treasure.